STAR Management System | Shaun Hopkins Seminars Ltd.
Shaun Hopkins Seminars offers a comprehensive curriculum of workshops for managers, front-line supervisors and team leaders. The 20 workshops are grouped under five categories: Manage Others, Manage Communication, Manage Teams, Manage Performance and Manage Self. Workshops can be completed in any order, separately or in combination to meet the management training needs of your staff. 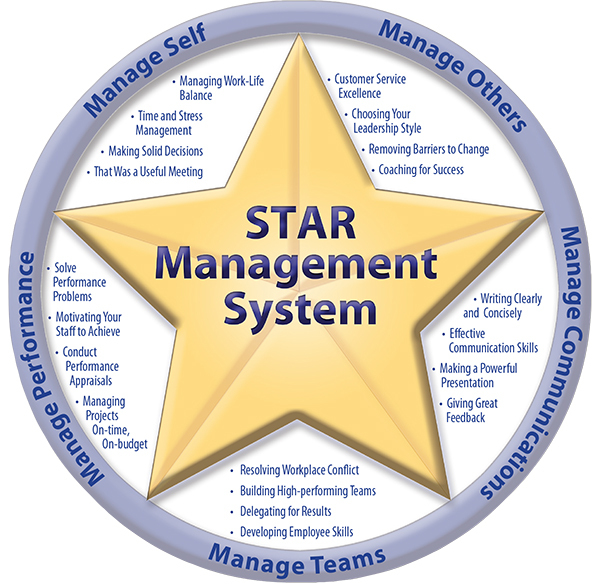 The STAR Management System can be delivered as instructor-led workshops or as live webinars. 1. Exceed the expectations of your internal and external customers. 2. Address the top ten customer service complaints about your organization. 3. Manage difficult customer situations to everyone’s satisfaction. 1. Determine the management style that will work best with each employee. 2. Adapt your leadership style to different situations. 3. Develop employee skill and commitment. 1. Get buy-in for changes from employees. 2. Identify barriers to implementing change. 3. Help employees cope with change. 1. Recognize the need and opportunity for coaching. 2. Assess the competencies of your employees. 3. Apply the coaching model to your daily management interactions. 1. Quickly generate ideas and organize your thoughts prior to writing. 2. Write using clear, concise and plain English. 3. Use precision, style and tone to personalize the message. 1. Create a positive rapport and climate with your staff. 2. Adapt your communication style. 1. Connect immediately with your audience. 2. Control your nervousness and anxiety. 3. Persuade your audience with the use of your voice and gestures. 1. Create a positive climate for feedback. 2. Give supportive and corrective feedback. 1. Determine the cause of the conflict. 2. Select a conflict resolution style. 2. Negotiate a win-win resolution. 1.Create a vision for your team. 2. Determine the ingredients of a high-performing team. 3. Motivate individuals to remain committed to team goals and objectives. 1. Determine what and what not to delegate. 2. Select the right employee for the assignment. 3. Develop your employees through delegation. 1. Determine the training needs of your employees. 2. Identify the best way for your employees to learn new skills. 3. Teach your employees how to perform new tasks. 1. Determine the cause of performance issues. 2. Determine the solutions to performance issues. 3. Apply a systematic approach to prevent performance issues from occurring. 1. Create a vision for your team. 2. Determine what motivates each team member. 3. Create a motivational work environment. 1. Prepare and write the performance review. 2. Conduct a positive and productive performance review meeting. 3. Monitor employees’ progress throughout the year. 1. Determine the scope, objective and stakeholders of the project. 2. Create a plan with the necessary resources and milestones. 3. Manage the project to ensure a successful outcome. 1. Define work-life balance in your life. 2. Create a work-life balance implementation strategy. 3. Build a support system to maintain your work-life balance. 1. Identify the causes of stress in your work life. 2. Determine your work priorities. 3. prioritize your daily action lists. 1. Uncover the root cause of problems. 2. Use 5 creative problem-solving techniques. 3. Gain the commitment of employees for your decisions. That Was a Useful Meeting! 1. Determine the reason for the meeting. 2. Gain the maximum group participation and discussion. 3. Create consensus for decisions.